Skloot, Rebecca (2010). 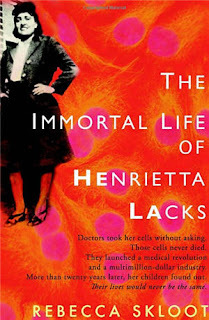 The Immortal Life of Henrietta Lacks. Published by Crown Publishing Group, New York. ISBN 9781400052172. From the publisher's book description: "Rebecca Skloot's fascinating account is the story of the life, and afterlife, of one woman who changed the medical world forever. Balancing the beauty and drama of scientific discovery with dark questions about who owns the stuff our bodies are made of, The Immortal Life of Henrietta Lacks is an extraordinary journey in search of the soul and story of a real woman, whose cells live on today in all four corners of the world." The Immortal Life of Henrietta Lacks is fascinating, eye-opening, educational and engaging. Skloot tells many sides of the story as she grapples with the complex issues of science for profit, informed consent and privacy in a developing field. The Lacks family ultimately understood the value of their mother's contribution to medicine and thanks to Skloot many others will too. As Henrietta's daughter Deborah says: "if you gonna go into history, you can’t do it with a hate attitude. You got to remember, times was different." Incidentally, the state of Maryland where much of the story takes place has among the most paternalistic laws relating to genetic testing today, to the chagrin of would-be direct-to-consumer customers. (See "Maryland says, no DTC genetic testing for you" by Frank Hecker.) Regulation doesn't necessarily benefit the individual sources of biological material.